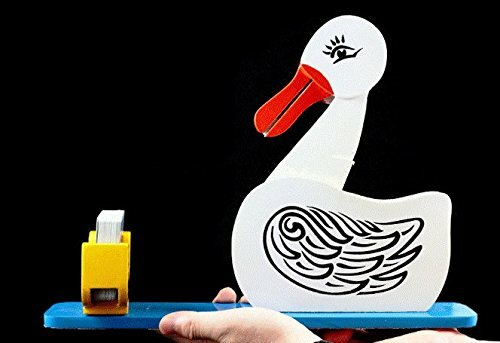 Educated Duck; "This is one of the cutest ways to produce a signed, selected (no force) playing card! Have someone freely select a card and sign it. It's lost inside the deck, the is deck placed in the holder of the duck which you introduce. Explain that he...or she will find the card. Of course you'll want to play this to the hilt. Have the duck nod to answer questions. Have the duck bite your finger and not let go. Have the duck blind-folded so it will not see the card.